Like most people (adults?) going to Philmont, Julie and I spent a lot of time exploring strategies and tactics for equipment. Much of our equipment was close to twenty years old (pre-kids backpacking days) so we knew a major refresh was in order. We leaned towards the ultra-light approach and used many ideas from the Backpacking Light web site and forums, including the excellent Philmont forum. The short story is that we spent a lot of money on new equipment for us, and a smaller amount of money on the boys (heck, they are on their own in a few years any way!). I opted for a down quilt instead of a traditional sleeping bag. It is lighter weight and worked well with the new Exped Synmat. Plus, it doubles as an insulating layer that I can wear like a down jacket. I brought only a single pair of convertible Kühl pants / shorts. They dry quickly and I wore them every day. Two pairs of underwear, three pairs of socks. I wore Montrail lightweight hikers most of the time and used leather Vibram five-fingers around camp. Three t-shirts (dry-fit style) and one well-worn Columbia button-down longsleeve. Go-lite rain pants and an Outdoor Research Helium II jacket. I’m not sure I even needed the rain pants. It does rain at Philmont, but it is so dry there that recovery is quick. I put on wet clothes one morning after laundry the night before didn’t dry, and my clothes were dry within 5 minutes. Sham Wow. Cheap, disposable, functional, weighs close to nothing, ’nuff said. Kindle Wifi 2, Sony 5N camera with pancake lens, iPhone turned off with SIM card removed most of the time. I talked before about our frustrations with the cooking philosophy changes at Philmont this year. As a result I had to carry a pot at the bottom of my pack that I didn’t plan on. Fortunately I was able to squeeze other items inside it so it didn’t impact my volume significantly. Our awesome Big Agnes Copper Spur UL 2p tent and Tyvek fly more than made up for this unwelcome addition to my load. In the end my base weight (without food or water) when we struck out on the trail was right around 20 lbs, fully loaded around 28 lbs. A far cry from my 45+ lb days in the early 90s! Here’s a detailed equipment summary of everything I took, including the weight of each item. This list doesn’t include crew-shared items we picked up at Philmont which included bear bags, bear ropes, and the aforementioned pot of shame (we divvied these up amongst the crew). 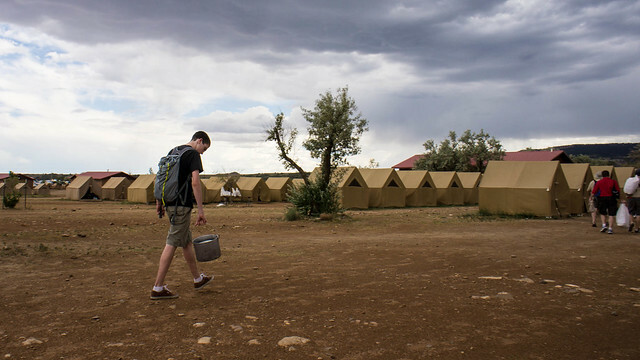 This article is part of my Philmont 2012 series. You can find all articles here.